Layyla over the rooftops of the world | My viewpoint of things – sometimes from the rooftops of the world, sometimes under the table and dreaming. Today is an anniversary of D-Day, the greatest landing operation of the Allies in the WW II. I don’t think I need to remind anyone what influence this had on the continuation of the War. I want to mark this occasion, as always, with something of art. 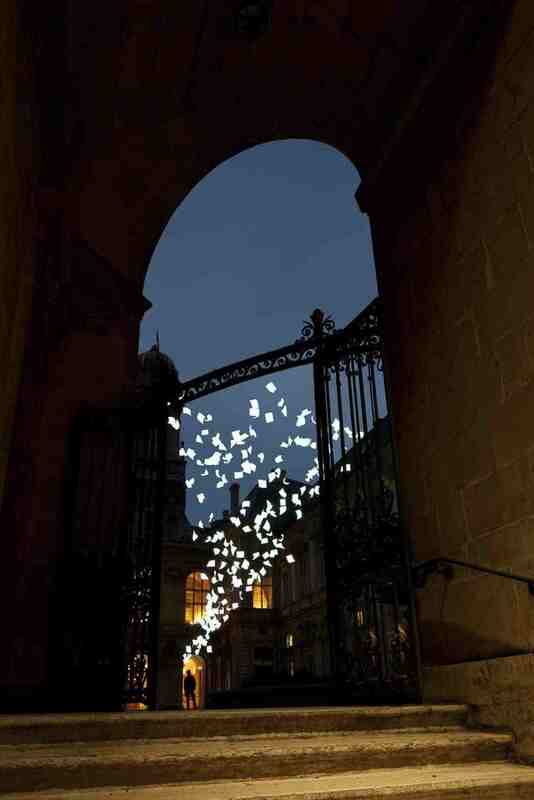 This particular installation’s taken place last year. To commemorate those fallen on D-Day in France – civilians, Axis and Allies alike – a pair of sand artists used stencils and solicited volunteers to create a highly temporary art installation, destined and designed to be washed away by the incoming tide. On September 21st, the pair and their helpers, given stencils and quick instructions, had to work quickly to make The Fallen a reality. At one point, it looked like they would not have even assistance to finish before the water came in to erase their creation. 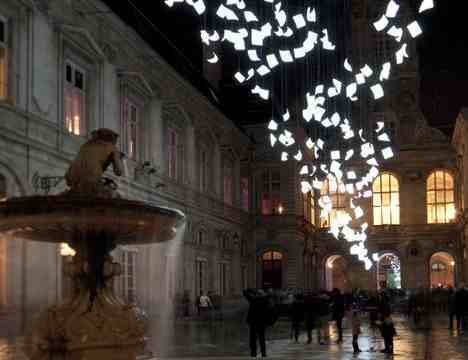 Jamie Wardley and Andy Moss developed the idea of The Fallen as a project for Peace Day well in advance. They created stencils in preparation, but were surprised by the people who turned up from around the world (drawn together, as it were) to commemorate those lost in World War II and otherwise. 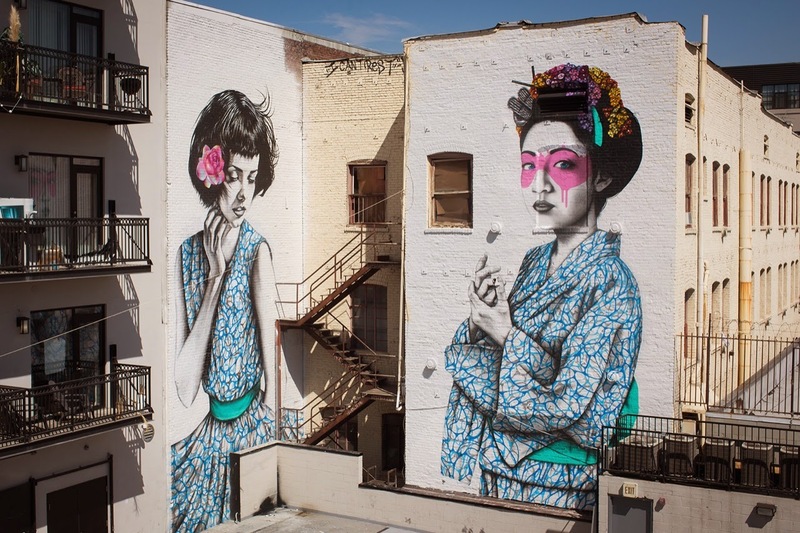 Upon Reflection is a beautiful, very feminine (although only one of the artists is a girl) new mural – a collaboration of Fin DAC and Angelina Christina which is featuring each artist’s distinctive style. The piece can be found at the corner of Winston and Los Angeles in Downtown Los Angeles, USA. “- Sonny, I need you cool, are you cool? is a perfect summary of the couple of photos I have found here and there. 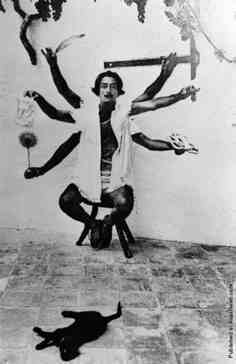 They are all of Salvador Dali, a prominent Catalan (not Spanish, mind you!) painter, architect known for his surrealistic art. In fact, he was such a personality and such a great artist that he was “cool” before anyone even knew the word and before it was “cool” to be “cool”. Or, in other words: eccentric. 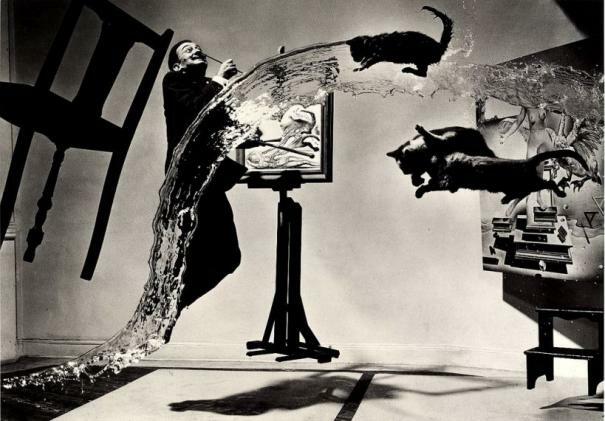 For instance, you may know this famous photo, entitled “Dali Atomicus“, a photo by Philippe Halsman who pictured Salvador Dalí suspended in mid-air. While today this image could easily be replicated in Photoshop, it wasn’t possible in 1948. It actually took 28 takes and a help of 5 assistants to get this image! The photographer counts: One… His wife Yvonne holds the chair up. Two… The assistants get ready with the water and the cats. Three… The assistants throw the cats from the right and the bucket of water from the left. 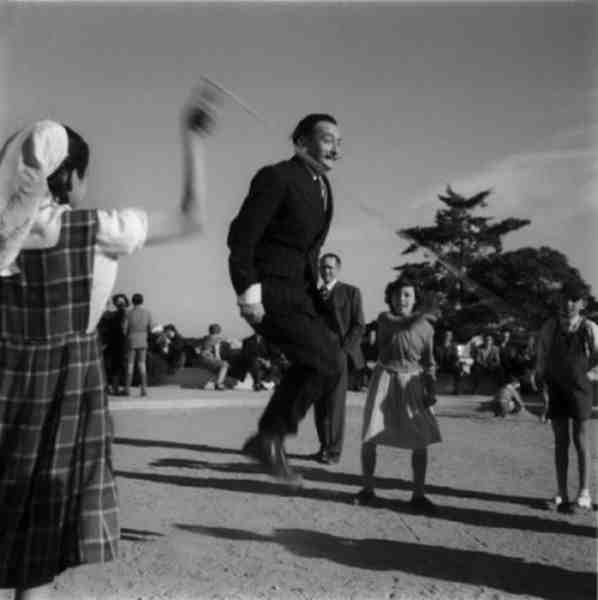 Four… Salvador Dali jumps… and miliseconds later—Philippe Halsman takes the photo. After the photo is taken: the photographer goes to the darkroom to develop it; the assistants mop the floor, catch and calm down the cats; Yvonne and Dali rest and wait for yet another shoot. As Halsman wrote in his book Halsman on the Creation of Photographic Ideas, “Six hours and twenty-eight throws later, the result satisfied my striving for perfection. (…) My assistants and I were wet, dirty, and near complete exhaustion—only the cats still looked like new“. You can actually watch the mis-takes on the photos here. 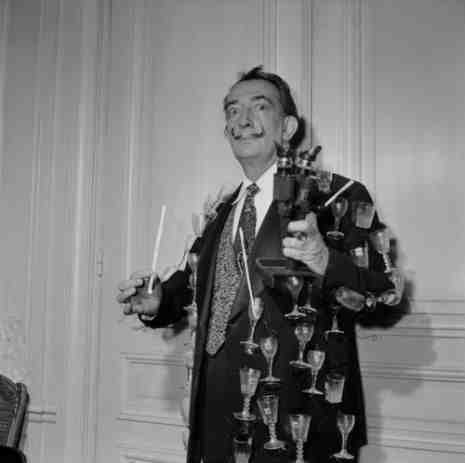 Below you can see Dali hosting a Surrealist party as a fund raiser for displaced European artists. Other form of entertainment would be a little sport. Like jumping rope. Here’s the artist’s doing a Buddha impression. 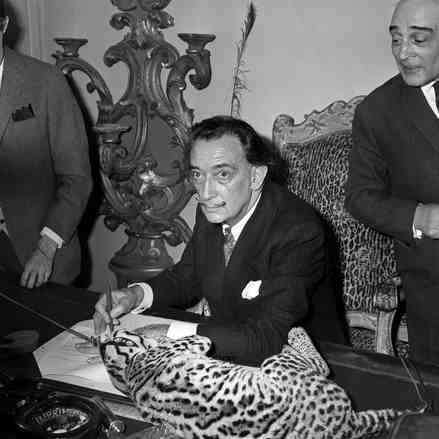 Dali also enjoyed pets company. Quite unusual pets, though. 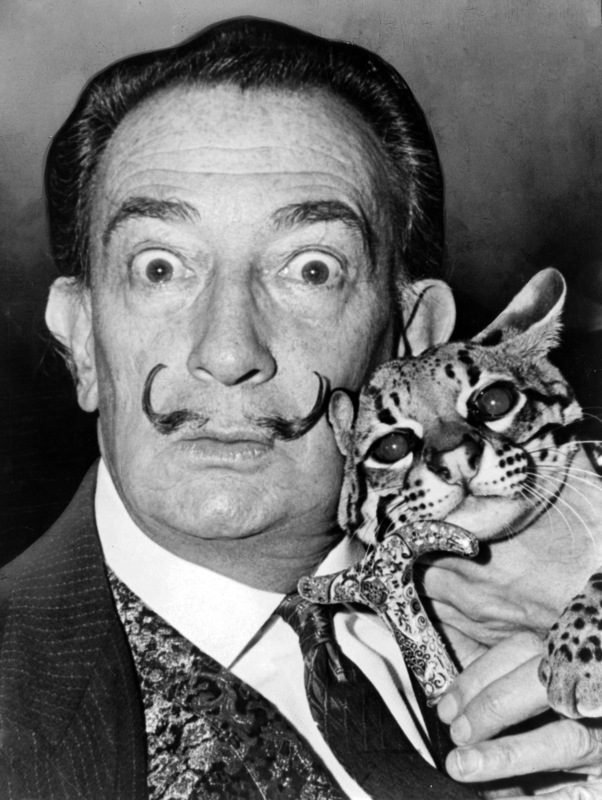 Here’s him with his little kitty, an ocelot…. 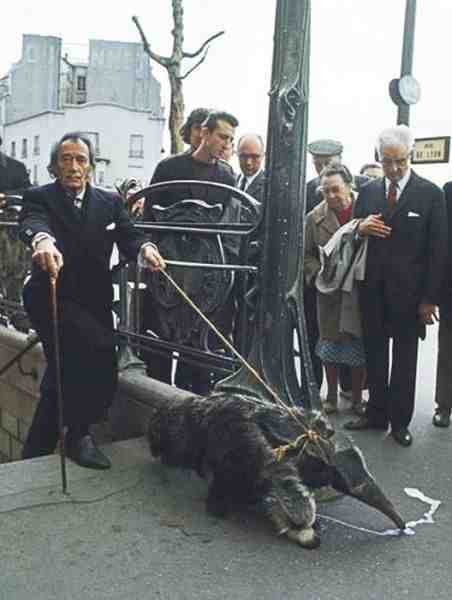 …and Salvador Dali walking his anteater. Of course. 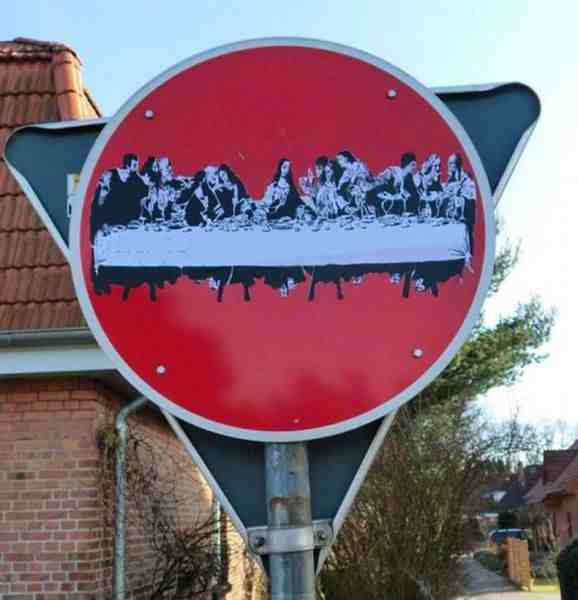 Since I am much into thinking into the field of “yarnbombing-crocheting-urban knitting” I though that maybe a post related to this would be welcome. Olek is a Poland-born (I can’t say I’m not proud of that), Brooklyn-based artist famous for her large scale crocheted objects. In 2012 she travelled to Brasil for the 2012 SESC Arts Show, a non-profit arts show across several venues that runs in São Paulo. With the help of a team of “crocheteiros,” (surely she couldn’t have done such a massive piece on her own) over a period of several weeks Olek completely covered the massive alligator in colorful North Carolinian acrylic yarn and Brazilian ribbons. Kids can climb in, through and on top of the brightly-colored alligator, which loses some of its intimidation with that blanket of pink yarn. I must say I absolutely love the array of colours and the idea of the entire work. I can’t possibly imagine to match the scale of the project, but I can say out loud I do admire the reptile. This time something from this little corner of the world. I hope – equally as interesting and charming as other wonders of the wide world. Zalipie is a village in southeastern Poland, 68 km east of the regional capital Kraków (Cracow), known for its wonderfully, rustically painted houses. nitially, the ornamentation was predominantly geometric with dots, curves, circles, zig-zags, and wavy lines etc. and the materials used were simply those that were most available like brown clay, soot, and lime. As an adhesive they used milk, sugar and egg whites or dumpling stock. Brushes were composed of horse hair, leather, or human hair; some of these types of brushes were still used up until a several years ago. 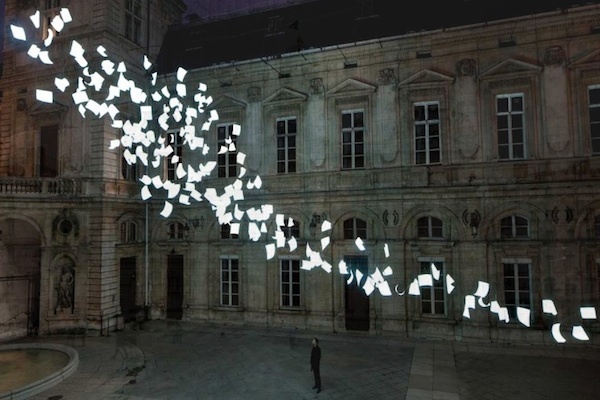 London designer Paul Cocksedge created a gorgeous installation resembling pieces of paper caught in a breeze for the in Lyon, France in 2011. 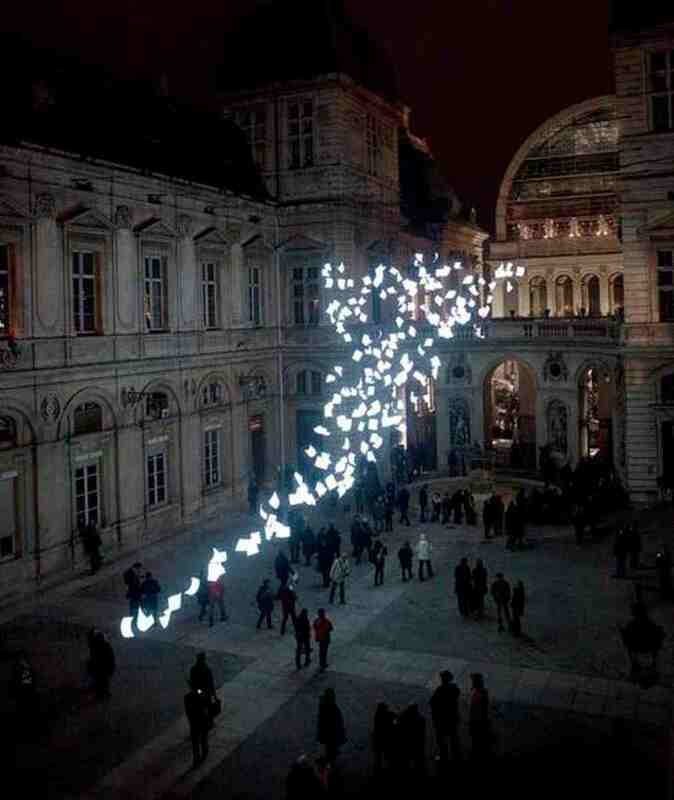 Installed in the courtyard of Lyon’s Hotel de Ville (City Hall), the 25-metre-long sculpture, called Bourrasque, was comprised of 200 A3-sized sheets made from an electrically conductive material that lights up when a current passes through it. Each of these double-sided sheets was individually moulded by hand in London, and then assembled on site.